Dr. Douglas Comer is an internationally recognized expert on TCP/IP protocols, computer networking, and the Internet. One of the researchers who contributed to the Internet as it was being formed in the late 1970s and 1980s, he was a member of the Internet Architecture Board, the group responsible for guiding the Internet's development. He was also chairman of the CSNET technical committee, a member of the CSNET executive committee, and chairman of DARPA's Distributed Systems Architecture Board. Comer has consulted for industry on the design of computer networks. In addition to giving talks in US universities, each year Comer lectures to academics and networking professionals around the world. Comer's operating system, XINU, and implementation of TCP/IP protocols (both documented in his textbooks), have been used in commercial products. Comer is a Distinguished Professor of Computer Science at Purdue University. He is currently on leave from Purdue, serving as VP of Research Collaboration at Cisco Systems. 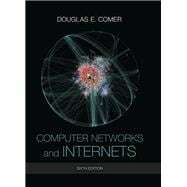 Recently, Comer has taught courses on networking, internetworking, computer architecture, and operating systems. He has developed innovative labs that provide students with the opportunity to gain hands-on experience with operating systems, networks, and protocols. In addition to writing a series of best-selling technical books that have been translated into 16 languages, he served as the North American editor of the journal Software — Practice and Experience for 20 years. Comer is a fellow of the ACM. For additional information, visit his web site.